Home INTERIORS OUTDOOR Outdoor styling tips when you’re working with next to nothing! As you might have seen, this month’s #stylecuratorchallenge is to style a pocket of your outdoors. Each month, we complete the challenges along with you and develop tips and tricks to help you nail the challenge yourself at home. This month, things are a little different though because my outdoor space is looking far from inspirational! While the thought of loaning designer outdoor furniture to pull together gorgeous imagery did cross my mind, I’ve decided to keep things real and instead give you styling tips for when you’re working with next to nothing. A reality for most of us is our outdoor spaces are last on the list to be completed. Having just finished the build of our new home, my focus has definitely been on finishing and styling the interiors so that’s why my front yard still resembles a construction site and the back patio that I have big plans for has barely moved. Despite this, there are a few simple things you can do to elevate your outdoor space without spending huge! Plants are a relatively inexpensive way to transform outdoor spaces. Not only do they bring life, you can select a variety of plants to introduce different textures, heights and colours for interest too. Depending on your space you could plant these or play around with different pots. 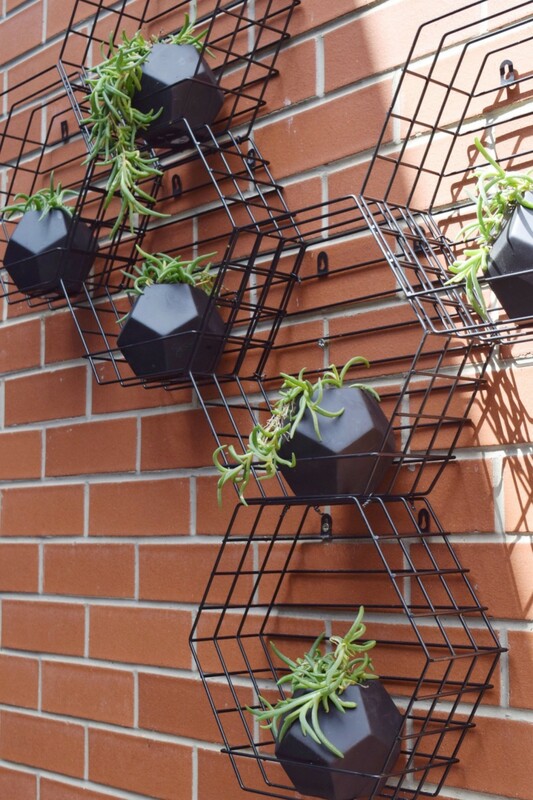 If you really want to get stuck into it, you might want to consider creating a green wall by running wires vertically that plants can grow up or a simpler way to create some green screening is to use a cluster of pot plants. Got ugly as furniture? Yep, I hear you! The solution, put a throw cushion on it! He he, sounds like I’m joking but I’m not. There is a range of great outdoor cushions on the market and our favourites (hence why we invited them to partner on this month’s challenge) is Basil Bangs. Not only are they bright, fun and great quality, they’re also at a great price point of $75 each so you can afford to buy a few and inject some colour and style to your outdoor space. 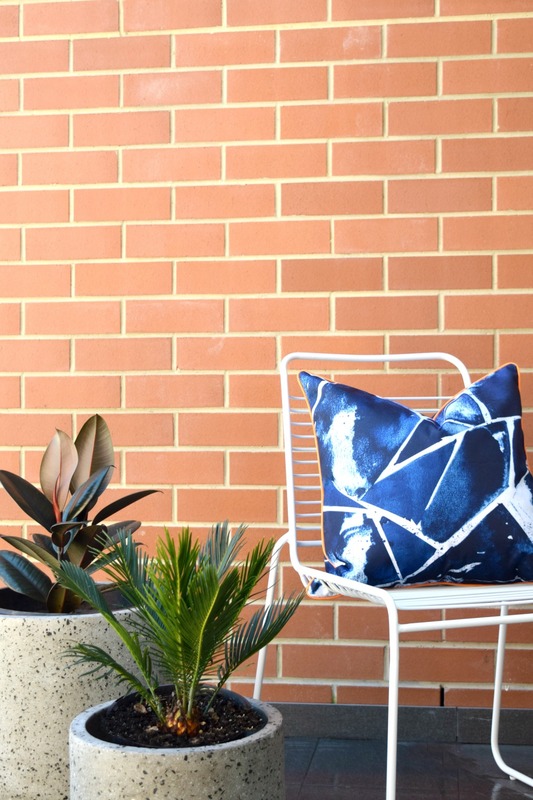 The minimalist in me goes straight to their black and white designs but ocean blues are one of the hottest colours this season and pops of colour look great in outdoor spaces. Don’t be shy to mix prints or colours, just look for some common thread. 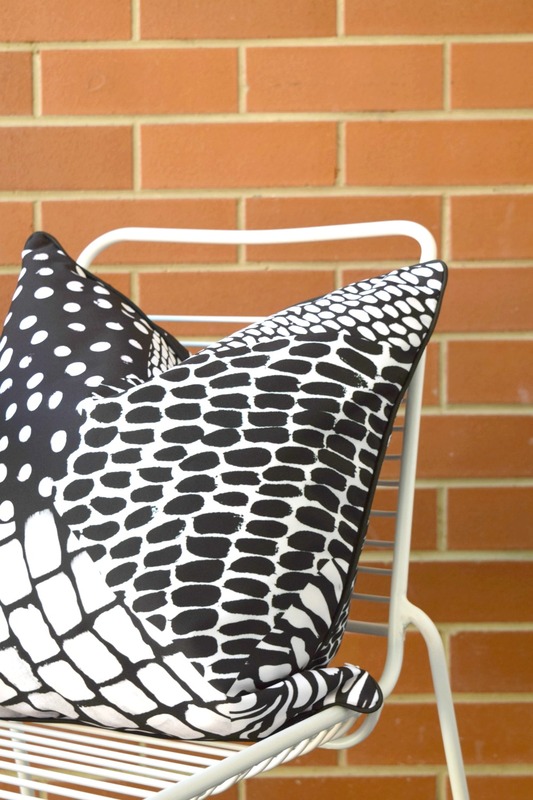 All the cushions I’ve used have a geometric element and a blue or black colour. So my solution when I can’t afford something? DIY it of course! Furniture wise, I’ve designed an L shaped in-built bench seat to flow from the kitchen sliding door into the alfresco space and I have an idea for a cool outdoor coffee table that I can’t wait to bring you. For now, I’m sporting my oh-so-unattractive round table that I purchased from the tip for our Spring styling shoot that I’ve hastily painted with white paint. If it stays out here, I’ll fix up the paint job but this table was only ever intended to be under a table cloth in styling shoots. The crazy expensive vertical garden that I want will never be within financial reach so I recently did a little Kmart hack for an inexpensive wall planter feature that’s actually been getting lots of compliments from guests. Still on my ‘to do’ list is stringing up festoon lights, fairy lights or lanterns. I want to get the furniture layout right out here before I begin adding these decorative items though as they may require me to drill into the ceiling or walls. If the layout I have planned doesn’t work and needs to be redesigned, I don’t want to have to remove the lighting and repatch. 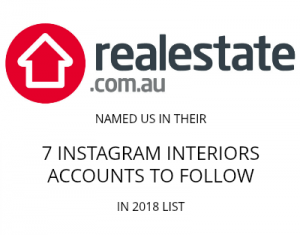 So there you have some simple and achievable ideas for lifting your outdoor space, if only a little bit, which is what these challenges are all about — working with what we’ve got to make small improvements around the home, month after month, until we’ve created the stylish homes we’ve dreamed of. I hope you’ll join in the challenge by sharing your outdoor space (on Instagram, Facebook, Twitter or Google+) using the #stylecuratorchallenge hashtag, tagging us @stylecuratorau and Basil Bangs @basilbangs. Can’t wait to see what you do with your outdoor space! Next articleOctober #stylecuratorchallenge with Hunting For George winner(s)!! !